The Victorian Veil Hat, made of artfully layered sheer fabric, is a fascinator style accessory ideal for any well-to-do Victorian lady. The delicate and translucent fabric drapes elegantly about the hair and face of its wearer. 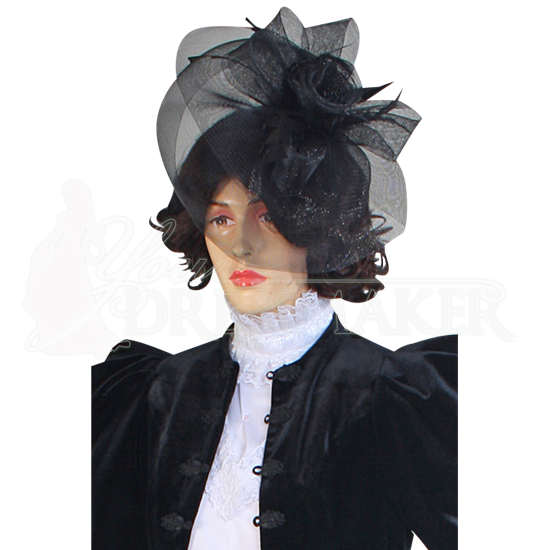 Expertly handmade, this headdress features a dark color and black feather embellishments for a look with mystique. Secured to the head of the wearer with hair clips, this Victorian hat will top off your period look with just the right touch of style.